This design would look great in a variety of constrasting woods. This table's thick sawn veneer gives it the durability of a solid wood table while allowing for book match patterns on the top and shelf. This table features lminate bent side panels with tambour accent drawer front. This table was designed as matched set with tambour door chest. A hand sawn veneer for top and apron, 3/32-thick, give the durability of solid wood while allowing a design that gives the tusk table an art deco feel. The simple lines on the tusk table allow the highly figured wood to take center stage on this piece. This arts and craft/art deco table can be made in a variety of contrasting woods or for a more traditional look in one kind of wood only. Thick veneer gives the durability of solid wood while allowing a bookmatch patern top. Hand-sawn 3/32" veneer gives the durability of solid wood. Hand-shaped legs give this table a graceful beauty. Fine silver and mother of pearl inlay really make this a unique piece. Graceful and flowing lines are created by the tusk-like shape of the legs on this piece. They also give the white oak table it’s name. 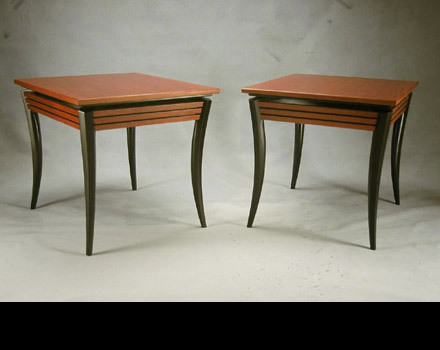 Hand-shaped legs, dark red mahogany, silver and mother of pearl inlay. Hand-shaped legs, dark red mahogany, fine silver, mother of pearl inlay, one drawer. Hand-shaped legs, dark red mahogany, fine silver and mother of pearl inlay. Curly maple, macassar ebony, ebony, abalone shell. Ruhlman inspired coffee table with a 4-way book matched walnut burl top and scalloped apron. Walnut dining table with clam shell extension. Closed position. Walnut dining table with clam shell extension. Full width. Walnut dining table with clam shell extension. Extension mechanism shown. William’s macassar ebony and ebonized cherry table (4th column, 6th row) was featured in the June 2010 Fine Woodworking Reader’s Gallery. (see top table in 3rd column). For information book click here. This table is triangular in shape with laminate bent apron. It has inlay around top and shelf and along the front of the legs.